What’s made up of 10 Toppers, 2 Laser 4.7’s, a Europe and a 29er? 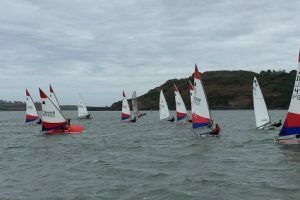 Answer: the first mixed dinghy league race outing of the season. All are very welcome every Saturday. Fg 14.30hrs. Dust off your Mirror and squeeze into your hikers for a summer of fun and competitive dinghy racing. Watch out as the new National 18s gracefully take to the water for their inaugural races in the Harbour. As always committee boat volunteers and qualified rib drivers will be given an exceptionally warm welcome.